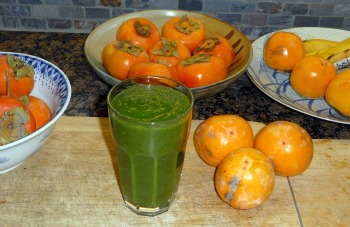 The persimmons make this a very creamy smoothie and such a tasty way to get your greens in. I used Amagaki persimmons which are somewhere between a Fuyu and Hychia. They are very sweet and tasty, loaded with flavor and are my favorite type of persimmon. Any persimmon or greens will work for this smoothie. Perhaps you want to add a little cinnamon or fresh mint to yours. I use a Blentec blender with 3 quart carafe so you may have to adjust the ingredients if using a smaller blender.